While I am a generally fitness-oriented dude who spends an inordinate amount of time in the gym (which I’m delaying by typing this post—bad gym rat! get to the gym!) and eating healthy things, I also have an uncontrollable love of gummy candy. And there’s one gummy bear that rises above the rest. 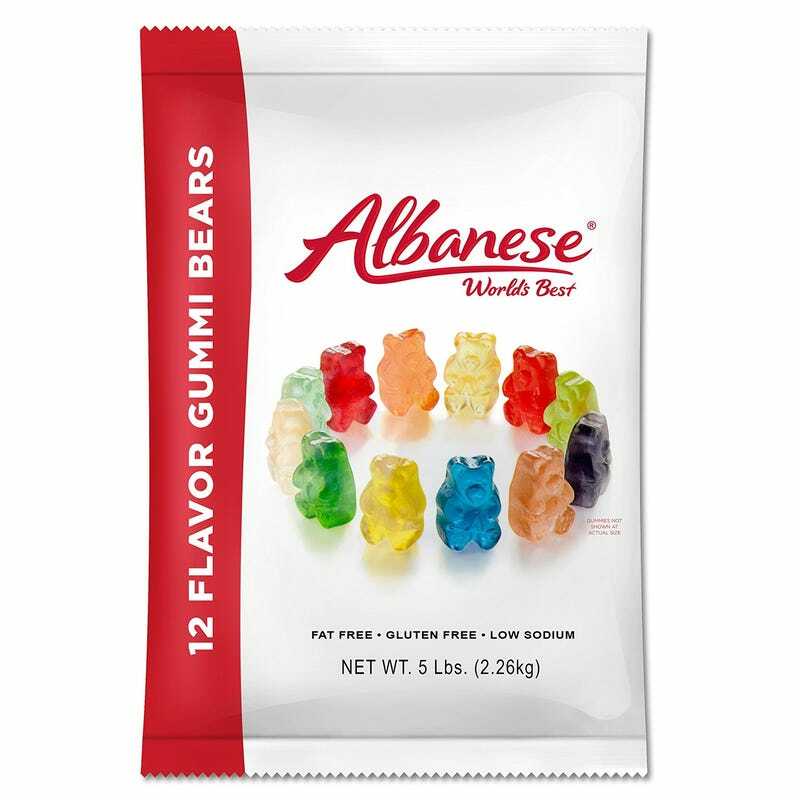 The indisputable king of all gummy bears are Albanese 12 Flavor Gummi Bears. They are amazing. I accidentally discovered them on a trip to visit my family, where my fiancee and I raided the snacks section at a local CVS and bought a 13 oz bag of them in their CVS private-branded form, for no reason other than the bag was resealable. We ate that whole bag in like 2 days. The next time I encountered these amazing 12 flavor gummi bears, it was in the genuine Albanese packaging, on the rack of totally random impulse-buy items at the Burlington Coat Factory checkout. I picked them up and put them down several times before restraining myself and not buying them. But I may have ranted about these incredible gummi bears a few times on facebook, so when my birthday came around, I received a shipment from my sister of a 12 pack of 12 flavor gummi bears. I busted out laughing when I opened the box, but now I’m in a real conundrum because I’m getting married in a couple weeks, and even with all the working out I do, I can’t be eating mass quantities of gummi bears if I want to look fly in my tux. I must look fly. I am struggling so bad to not eat these goddamn delicious gummi bears! Between my fiancee and me, we’ve only eaten 1.75 bags of the 12, and that’s 11 whole days after receiving them. The struggle is real. Not only does Amazon sell these gummy bears in ridiculous quantities like a 5 lb bag, but the 12 pack of 12 bags has a Subscribe-n-Save option. Which strikes me as a perfect way to sabotage someone you hate, all while they think you think they really love gummi bears. They will be powerless to control themselves when surrounded by gummi bears, and gain 75 lbs a month while you cackle maniacally to nobody in particular. Just remember like Scarface and Notorious B.I.G. said, don’t get high on your own supply.